Beaumont's Council voted on September 11, to proceed with a $29.5 million dollar renovation to the Aqua-Fit Centre. Construction began on October 1, 2018. Council also approved the Aqua-Fit Phase 2 name change to Beaumont Sport and Recreation Centre / centre sportif et de loisirs Beaumont. Beaumont Sport and Recreation Centre Project is an expansion and modernization of the existing Aqua-Fit Centre. Other updates will include mechanical updates to the pool filtration system. Commenced deep and shallow interior mechanical runs between GL B & D approx. We understand many users and members will be impacted during construction in various ways. Current members can explore the different membership option at BSRC Membership Options. Beaumont, AB - At an event this afternoon, Mayor John Stewart (Beaumont), Mayor Tanni Doblanko (Leduc County) and Honourable Shaye Anderson (Minister Municipal Affairs) officially broke ground on the new Beaumont Sports and Recreation Centre (BSRC). “Recreation Centre are hubs of the community, places where families gather, friends meet and children learn skills that they’ll carry with them for their whole lives. 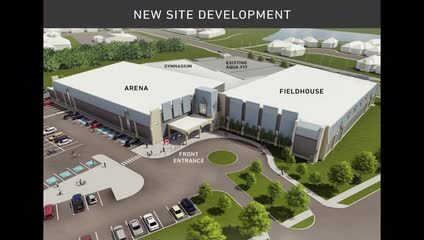 Construction of Beaumont Sport and Recreation Centre will allow residents to engage in regular sports and physical activities, promoting the adoption of healthy lifestyles, and I am I’m confident that the expansion and modernization of Beaumont Sports and Recreation Centre is an important step for not only Beaumont’s future but this region’s future. We are working together to improve our whole area’s livability and affordable recreation destination for area families,” said Mayor John Stewart, Town of Beaumont. Leduc County and the Town of Beaumont recognize the importance of having quality recreational infrastructure that encourages people to adopt healthy lifestyles and contributes to making communities vibrant and inclusive. Through a joint funding agreement, Leduc County and Town of Beaumont residents will benefit from the expansion and modernization of the Aqua-Fit Centre. The expansion will enhance residents’ quality of life and will contribute to the growth of sporting activities and community prosperity. From 2019 to 2023, Leduc County will invest $2.4 million towards the $ 29.5 million expansion of the Aqua-Fit Centre. Beaumont Town Council voted on September 11, to proceed with a $29.5 million dollar renovation to the Aqua-Fit Centre. Construction is scheduled to begin October 2018 and will take 20 months to complete. Town Council also voted to change the name of the Aqua-Fit Centre to the Beaumont Sport and Recreation Centre / centre sportif et de loisirs Beaumont. The new temporary dog (all breeds) park’s fence is getting realigned by moving it further South from its current location. The fence realignment is taking place to better serve the overall community needs. The realignment will occur on Thursday, January 24, 2019. The Dog Park site will remain open until the dog (all breeds) park fence line has been installed to allow a seamless transition as the realignment occurs. New access will be from 50 AVE for the new location. *The small dog park will not be a part of this change. Please call 780-929-8256, if you require any additional information. Thank you for your feedback. Beaumont has chosen to go with two of the three proposed sites for the new temporary dog park locations. Construction on the new parks will begin on December 5, 2018, and they are scheduled to be open to the public on December 10, 2018. The old site will close December 15, 2018, in order to allow a smooth transition between old and new. With the closing of the temporary dog park on October 1st, and the South West portion due to close by December 1st, 2018. Parks and Facilities Services is working with various stakeholders to find suitable sites for temporary use. We engaged the concerned residents of Beaumont with an open house, on social media and this is what we heard. Can I prebook for a space in the drop in classes?